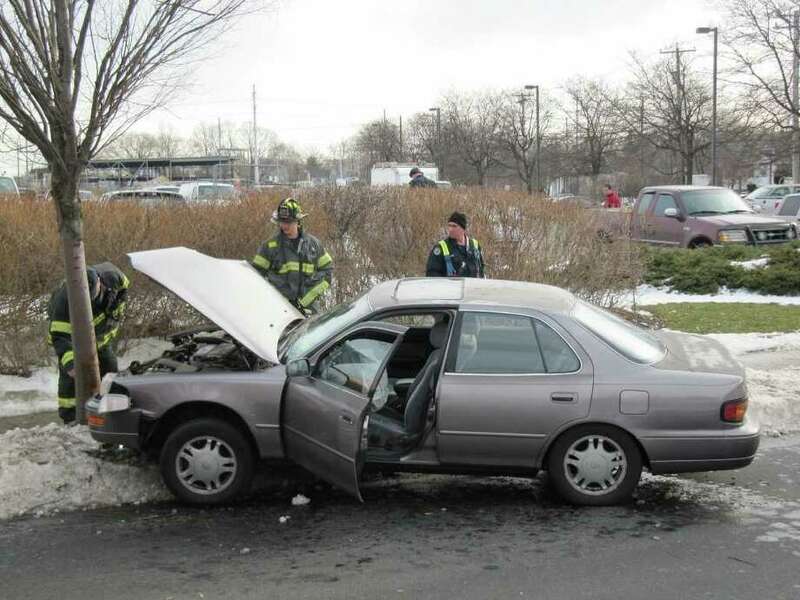 A woman crashed her 1992 Toyota into a tree on Kings Highway around 1 p.m. Thursday. Police said she took too wide of a left turn from Grasmere Avenue. Emergency crews scrambled to the scene of a car that crashed into a tree at Kings Highway and Grasmere Avenue about 1 p.m. today. The woman driving the 1992 Toyota took too wide a turn and lost control, plowing into a snow bank and the tree, according to a Fairfield police sergeant on scene. Original reports indicated the car burst into flames after the crash, but there was no fire when firefighters arrived on the scene. It was not immediately clear whether the driver would be taken to the hospital for treatment. Meanwhile, at the same time in the nearby Home Depot parking lot, a man who allegedly had a gun in his possession was taken into custody by police. No details on the incident were available as this afternoon.